Welcome to Natural History of the Kitchen, by EMD's Stephanie Butler. Each week, Stephanie explores the background of an appliance, gadget or product that helped to make cooking what it is today. This week: Stoves. If you're like most Americans, you probably don't think about your stove much. Sure, you know the difference between gas and electric, and you might have even passed a few stray minutes staring into the window of a fancy kitchen store, imagining yourself at a professional-grade range complete with flattop and water feature. You'd have a very different attitude if you had to hunch over a fireplace at five in the morning, or light an antique gas range before your morning coffee. This week we're taking a look at the history of the stove, from wood burning to electric. Early American kitchens were centered around the hearth, a monster of a fireplace that could dominate entire rooms: some were so large that seats were built in around the edges. Cooking fires were continually fueled throughout the day, by hickory and applewood long before they were trendy fuels for smoked foods. After supper, cooks kept fading embers alive with a brass cover called a curfew (our modern use of the word comes from this antique appliance). The dying fire was kept alive until the next morning, when the stoking/feeding/cooking cycle began anew. 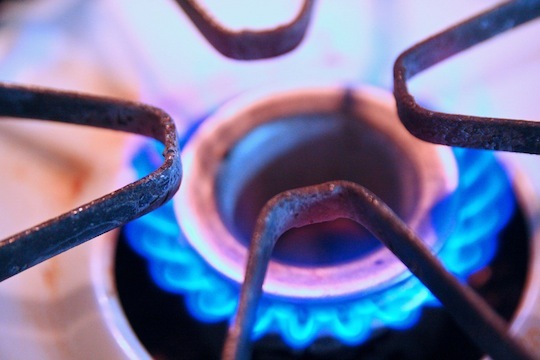 The first gas stove was patented in England in 1826, but it took years for infrastructure to catch up with the promise of gas cooking. At the World's Fair in London in 1851, a number of gas stoves were exhibited, but gas wasn't routinely piped into homes until late in the century. By the time WWI came around, the new gas ovens permanently extinguished fireplace cooking. 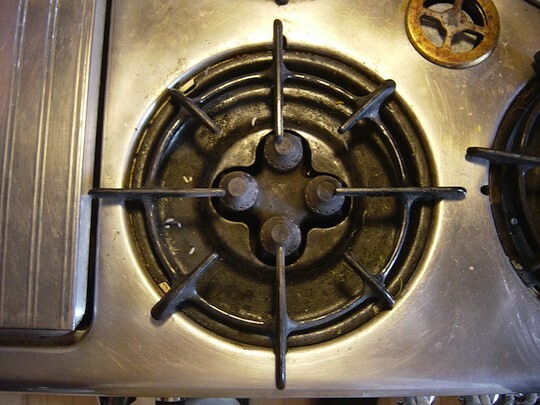 Electric stoves also have a surprisingly long history. A Canadian named Thomas Ahearn invented the electric cook top in the late 19th century, and became the first person to cook an entire meal on the range in 1892, which he then delivered personally to waiting eaters at the Windsor Hotel in Ottawa. Like gas fifty years before, the new stoves were forced to wait while technology caught up to them. When cities got electricity around the Depression, the ease and simplicity of electric cooking caught on. This is a look back at the fireplaces, pokers, and bellows of yore, with a trip to the King's Arms Tavern in Williamsburg, Virginia for Creamed Celery with Pecans. Preheat the oven to 400° F. Grease a 1 ½-quart casserole. Boil the celery in enough water to cover until tender; drain. Melt the butter over medium heat; stir in the flour and slowly add the milk to make a cream sauce, stirring until thick and smooth. Add the salt and well-drained celery. Spoon into the prepared casserole, top with pecans, and cover with buttered breadcrumbs. Bake at 400° F. for 15 minutes. Install a genuine Rumford Stove in your home! Bellows not included. This October, take a colonial cooking class in Connecticut. An article on colonial foodways in Williamsburg, and the way docents and artisans recreate them today. A great piece from Plow and Hearth detailing how to cook on woodstoves and fireplaces. 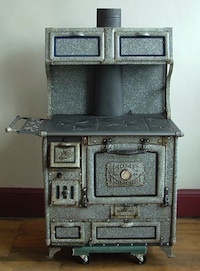 Stephanie, thanks for this interesting look into the evolution of kitchen stoves. A great source of further reading is the book From Fireplace to Cook Stove: Technology and the American Ideal, by Priscilla J. Brewer (Syracuse U Press, 2000). 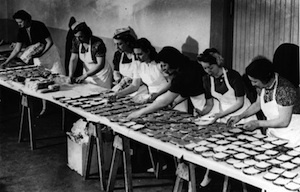 It's a fascinating social history, not only about stove development, but how evolving cooking methods fundamentally changed women's lives and what people ate. It's got terrific illustrations, too. Grandma wasn't a great cook but she was a masterful baker -- a fact that I didn't appreciate until I was grown up. Producing beautiful loaves of bread and terrific pies from an oven fueled by wood is not easy. Thanks for the info. I can remember my grandmother saying with delight, "Now, we are cookin' with gas!!" as in whatever we were doing was as modern as it could be. The only wood stove I've ever seen used was at a girl scout camp. I will never forget those women who showed us a whole new world when they provided food for us off it. I will also never forget looking under the removeable eye at the fire. It was a revelation. Even though I currently have one of the superstoves in my kitchen, I will always remember the warmth generated by that wood burning stove. I have never felt anything like it since.